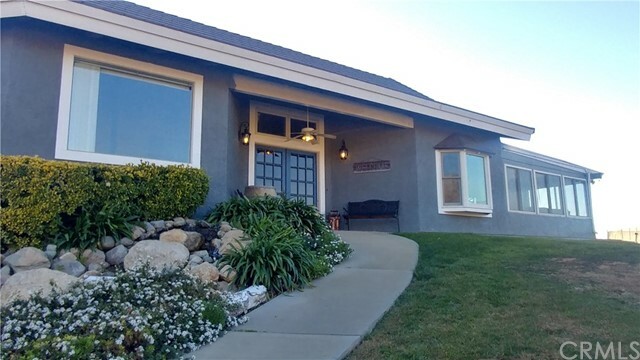 All Yucaipa homes currently listed for sale in Yucaipa as of 04/19/2019 are shown below. You can change the search criteria at any time by pressing the 'Change Search' button below. "This Estate sits on just over 5 acres, featuring 2 separate homes. From the moment you walk through the front door and onto the foyer, you feel the refined elegance of this stunning modern estate. Huge travertine slab floors, framed with distressed wood accents. The first floor hosts the master bedroom with a huge master on suite, with Jacuzzi tub, shower and walk-in closet. The second 1st floor bedroom features a full bathroom as well. The kitchen is Large & bright with custom cabinetry, Granite counter tops & stainless steel appliances. Family room has wood-beamed ceiling with granite fireplace. Other amenities include a Butler pantry, beautiful dining room, activity room, living room overlooking the infinity pool, laundry room with desk area. Upstairs there are 6 bedrooms (1 with huge patio overlooking the pool) and 3 full baths, 1 is a Jack and Jill. Loft area includes a wet bar with plenty of cabinet space for all your beverages. The 6th bedroom is currently being used as an office, Cigar patio/with fireplace. The 2nd house on this property has 2 bedrooms and 2 full baths. Master bathroom has a Jacuzzi tub. Full kitchen and living room with fireplace and laundry room, built-in BBQ under a covered patio. Exterior features include: 3 car garage, 3 covered patios, and fire pit, 2 built in BBQ s, large sparkling infinity pool & spa. Also has a beautiful detached wine cellar. One of the covered Patios has a Keg-orator beer tap. Could be subdivided into 4 separate parcels." "31.33 acres of land in the newly emerging wine industry of Yucaipa Valley. The Yucaipa Valley is ideal for growing grapes because of high elevation, good drainage, temperature variations & the fact that grapes are not a water intensive crop. A petition has been filed with the Tobacco Tax and Trade Bureau (TTB) to create the Yucaipa Valley AVA (American Viticultural Area) This is a designation granted by the federal government that permits the commercial production of wine from grapes grown within the designated area. 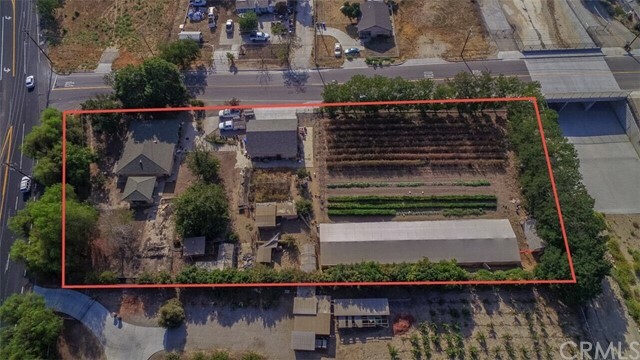 The AVA will create a sustainable wine economy in the Yucaipa Yalley, an economy that will most likely completely transform Yucaipa and the area within the AVA s designated boundaries which this property falls within. The property would also be suitable for orchards, religious or corporate retreat, wedding or event venue, horse ranch, bed & breakfast or simply your own private sanctuary. Take I-10 E to Live Oak Canyon Rd in Yucaipa. Take exit 85 from I-10 E for Live Oak Canyon. Follow Live Oak Canyon north to Potato Canyon Rd. Make a right on Potato Canyon and then first right on Sunset. Property is first driveway on left off Sunset." "Beautiful Custom Estate Home on a 5-acre lot, this home is truly a breathtaking beauty. Located in a gated community that offers 360-degree views. This spectacular home has all the amenities that you would dream of, grand entryway with designer doors and a custom chandelier with dual stairs at the large foyer. Custom ceramic tile in the downstairs area and wrought iron custom stair railing. A dream to behold is the large kitchen with stainless steel appliances including a trash compactor as well. This home also has a theater room, fireplaces, coffer ceilings, granite countertops, surround sound system, ceiling fans throughout, large closet space, and a so many added touches you have to see to believe. A luxury home like this must be seen, come see your impossible dream fulfilled with this custom estate home." 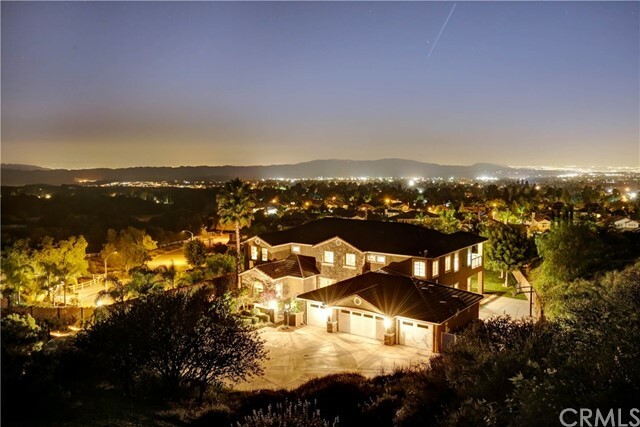 "One of a kind home at the top of Whisper Ranch with stunning, sweeping views of the San Gabriel, San Bernardino, Santa Ana, and San Diego mountains and the dancing, glittering lights of Riverside, San Bernardino, and Los Angeles Counties. 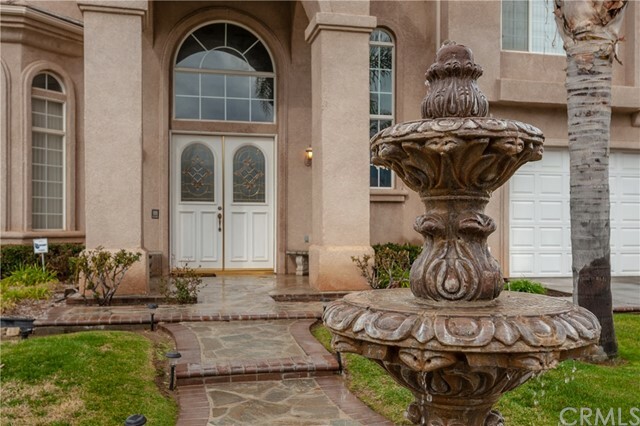 This beautiful, two-story home is at the end of a cul-de-sac and has a private, gated entrance. Four bedrooms with four full baths and two half baths. In addition, this home includes a theater room, game room , view loft, and wine cellar. Dramatic high, 10'-21', ceiling lines throughout, gourmet kitchen with butlers pantry, and a whole-house entertainment system. Two sets of stairs are both front and rear loading. Outside features includes beautifully manicured landscaping throughout (ideal for parties and weddings), covered patios and decks, motor court, stone patios, outdoor cooking area, fire pit, courtyard, and basket ball area. Room to build a casita, pool with cabana, and a detached RV garage." "Welcome to the Creekside Drive Estate Community! 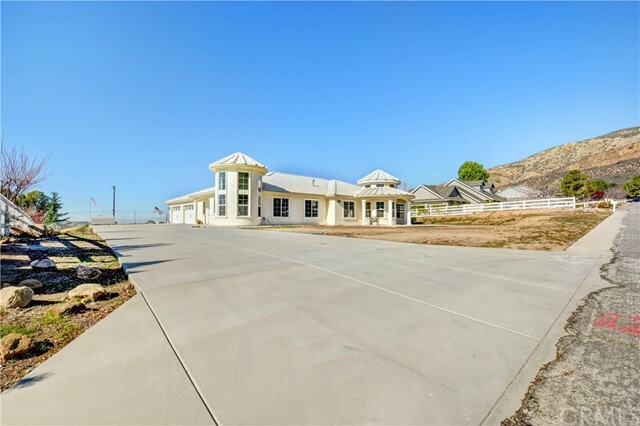 This Gorgeous custom home is nestled in the beautiful North Bench of Yucaipa, and boasts approx. 5,000 sq.ft. of living space. Step inside and immediately feel the opulence. The entrance welcomes you with beautiful glass and Wroght-Iron Double Front Doors. The Foyer has a sweeping Custom Staircase with wronght-iron handrail matching the front doors. Bright and airy design with open and inviting floorplan, perfect for entertaining. Home has one full bedroom and bathroom downstairs, could be second master suite. Full office downstairs at the entrance of the home for the business owner or craft lover. In addition, a separate study/library/or second office, conveniently located near the garage. Absolute dream Kitchen ready for that professional cook. All white custom shaker cabinets with soft close hinges, topped off with light gray quartz. Large kitchen island with small sink. Full wet bar area adjacent to walk in pantry. Every bedroom features a walk in closet. Dual sinks in all full bathrooms with stone surfaces. Dual AC systems up and down and tankless water heater. Front and side of home have complete sprinkler system and drip system for future plantings. Home is on a full acre of land and features amazing views of the mountains on one side and a spectacular city light view on the other. No expense was spared with this grand estate. Your friends will be truly jealous!" 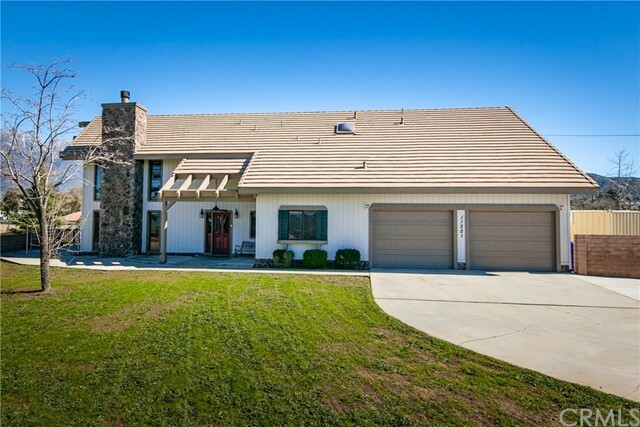 "A magnificent home in the Beautiful Whisper Ranch area of Yucaipa. Built in 2003, this semi-custom, open concept home amazes throughout with its elegant features & designer look. Walk through the front doors into an entryway with a 21' foot ceiling & grand staircase. Imagine yourself cooking in the gourmet kitchen with an oversized Jenn-Air gas range & complimentary butler pantry. Entertain with delight in its spacious living areas & a gorgeous yard where you & yours can enjoy the pool, spa & waterfall. All can be controlled by your mobile device, perfect for a relaxing evening w/the family or a lively summer party. 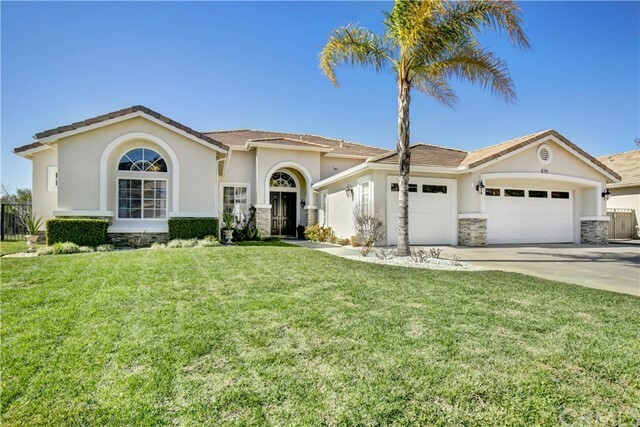 This home boasts 5 spacious bedrooms & four full baths. The master suite offers a deck with a gorgeous view of the property as well a master bath with double sinks, a large tiled walk-in shower, a large bathtub, a walk-in closet, & a two-sided fireplace. Enjoy a warm bath-by the glowing fire to warm up on a cold night, relax muscles or simply to pamper yourself. Continuing with the trend of grandeur, it's deep, four car garage has epoxy coated flooring with abundant cabinets & storage space. For the adventurers in your family, this lot includes parking for your boat or RV. Here you'll have more than enough space to accommodate your family & your dreams! 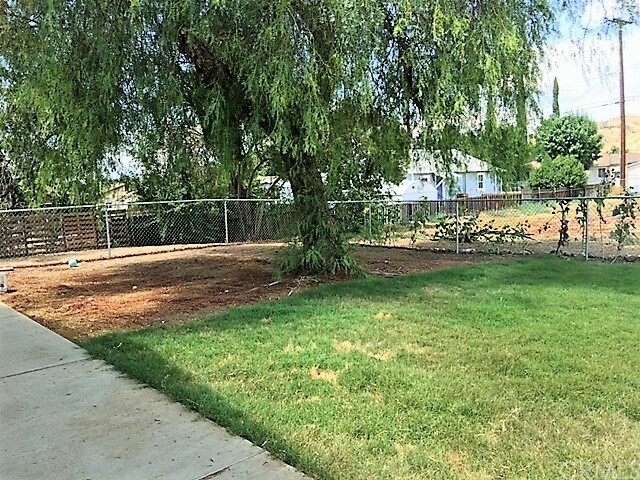 Additional features include a fenced in dog run, a covered patio with a barbecue, a laundry room, & plenty of space for your unique wants & needs. Please check out the wonderful photos and 3D virtual tour above." 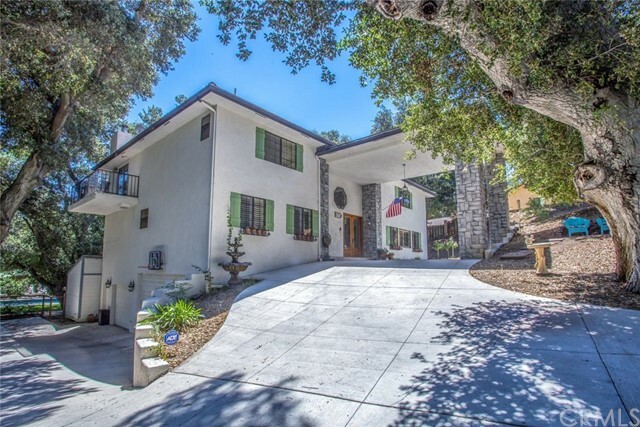 "Nestled among the majestic oak trees, this custom 4274 square foot home is highly upgraded and fabulously presented. The impressive list of interior upgrades include: double mahogany and glass entry doors, an updated kitchen with large island, stainless steel appliances, granite counter tops, rich darker cabinetry, a pantry and a huge window overlooking the deck area. Wood floors, plantation shutters, crown moldings, newer Mohawk carpet and three custom fireplaces. Each of the over-sized bedrooms is a suite with full bathroom attached. The master retreat is enormous and the bath is upgraded with an large spa tub, custom walk-in shower, quartz counters, walk-in closet and a viewing balcony. The impressive two story entry features a sweeping staircase that leads to a spacious open loft. A fabulous rear deck overlooks the backyard complete with newer heated, SALTWATER POOL, electric pool cover, a work shop and so much more. Newer furnaces with new HVAC ducting and a highly efficient whole house fan. The 3-car over-sized garage has an abundance of built in storage and newer garage door openers. A Porte-Cochere entrance with circular and side drive with room for RV parking. This spectacular home has a mountain feeling can be enjoyed everyday without the drive and inconvenience." "This beautiful home is located in Hidden Meadows with 5,840 square feet of living space. Lots of room on a 24,500 square foot level lot. 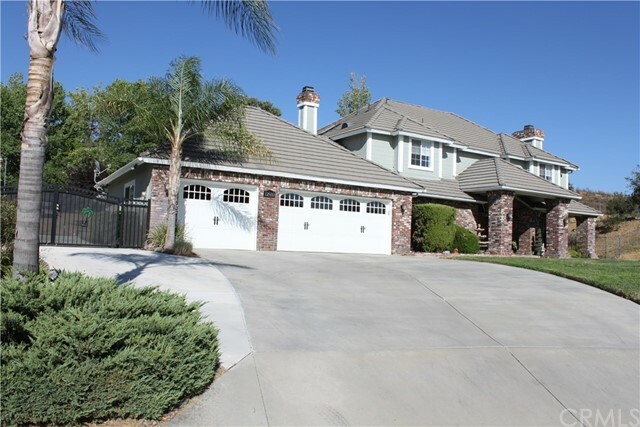 When you enter the home you are in a large foyer with circular staircase and vaulted ceiling. Rooms are extra large, Formal Living Room, Formal Dining Room, Kitchen, Family Room, 16 Seat Movie Theater and a Very Large Master Suite with Walk-in Closet and Exercise Room. Bedrooms are over sized and have walk-in closets. Very large walled landscaped rear yard. There is an extra Bedroom in Garage area thats not permitted and will be removed if Buyer requests. On the roof is a Leased Solar System that the Owner says reduces his electric bill by 2/3." "Just listed! 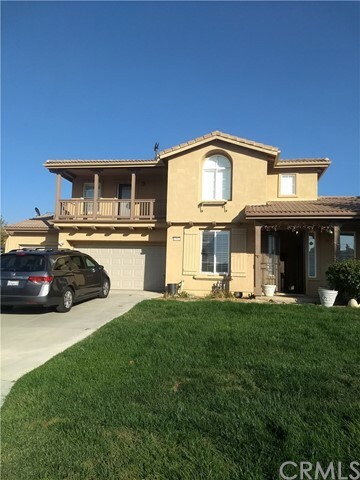 Check out this immaculate 5 bedroom, 4.5 bathroom two story home located in the Oak Glen community in the city of Yucaipa. This home features a spacious floor plan, heated pool/spa, a huge lot, 4 car garage are just a few great features that comes with this home. The layout features a grand living room, with high ceilings, crown molding throughout the home, custom waterproof laminate flooring, tile flooring and carpet in several areas of the home. There is a fireplace in the living room, a formal dining room, a nice spacious kitchen with granite counter tops, cherry wood cabinets, a breakfast bar and eating area. The family room a has a media niche and it has a fireplace. Alarm system and intercom system throughout the house. The main floor bedroom has it's own private bathroom. The upstairs master bedroom has a huge walk-in closet, dual sinks, along with a separate tub and shower and a balcony which allows you to see the beautiful mountains and the city lights. This gorgeous home has 3 additional upstairs bedrooms with private bathroom. The back yard features RV Parking, covered patio, Barbecue Island, tropical pool and spa which makes it great for entertaining family and friends. There is room to build in the huge backyard. This home offers privacy and a rural setting, however there is easy access to freeways, schools, and shopping. Don't miss out on this opportunity to enjoy the great comforts and amenities of this gorgeous home." 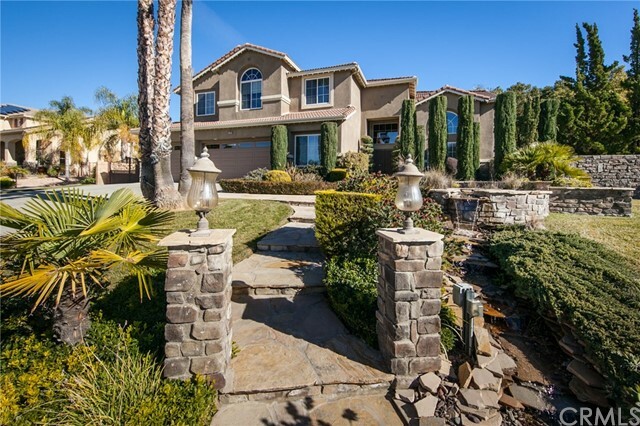 "PRICE REDUCTION** MOTIVATED SELLER** Beautiful Custom Home w/ Amazing Views in Yucaipa! Your love for this home will start in the driveway of paving stones and your parking option of the 4 car garage. The main floor features custom cut tile throughout, crown molding, ceiling fans in every room, office w/ double doors, formal dining room, plantation shutters, and surround sound. Walk in to your private master suite w/ views of the south mountains, walk in closet and shower, soaking tub, vanity and fireplace. One the opposite side of the home is another bedroom with full bath, laundry room, family room with oversized gas fireplace and gourmet kitchen featuring granite counters, island, ample custom solid oak cabinets, stainless steel appliances, double oven w/ warming drawer and built in refrigerator. The second story features a loft w/ kitchenette, 2 additional bedrooms each w/ own bathrooms and views, views, views! All of this sits on over 1/2 acre of privacy! Come take a look, you won't be disappointed!" "Your Own Private Resort Awaits in this Stunning Custom Built Ranch Home that was Made for Entertaining or Peaceful Enjoyment. Gourmet Kitchen was designed with Center Island Seating, Copious amounts of Granite topped Cabinetry, Professional Series Viking Stove with Matching Viking Appliances and Sub Zero Refrigerator to Match Cabinets. The Interior Features a Library with Floor to Ceiling Brick Fireplace & Hearth, Formal Dining Room, Basement/Wine Cellar, Luxurious Living Room and Whimsical Hand Painted Murals. 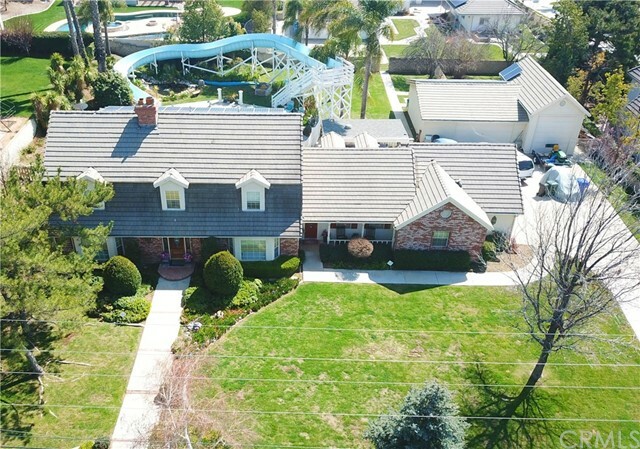 The Exterior is Extraordinary with a Giant Water Slide that drops into a Heart Shaped Pool, A Covered Patio & BBQ Island, Koi Pond, Additional Detached 2 Car Garage PLUS RV Garage. The 88 Solar Panels Are Owned and Produce Enough Energy to Operate the Entire Property. This Magical Estate Has it All!" "4200 Square Feet living space / 6376 Square feet under roof Built 2015 .4 Bedroom, 2.5 Bath, 0.93 Acres, Mountain Views all around. Backed up to Farmland and National Forest. 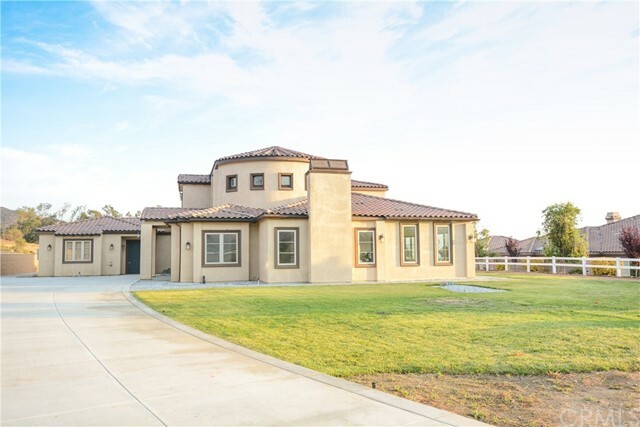 This Custom home includes 10 foot ceilings, 2 - 16 foot Turrets, open floor plan, RV Parking, 1404 Square Feet 4 Car garage, 5 Covered Patios, Huge Viewing Deck, Granite throughout, Custom Cabinets, 4 foot x 8 foot master shower, Jacuzzi Tub in Master, huge his and hers Walk in closets, Farm Sinks throughout, 2 Fire Places, Hair Salon, Dog Grooming Tub / Salon, Sprinkler System, Large Laundry room, Double Ovens, 6 Burner Dacor stove, Custom Flooring throughout, 707 Square foot bedroom / Meeting room or Guest quarters with separate entrance.Built 2 x 6 lumber, Insulated interior walls and attic, very energy efficient. 2 Separate Air Conditioning units, Custom Lighting throughout, very quite neighborhood on a Cul De Sac." "Your search is over! 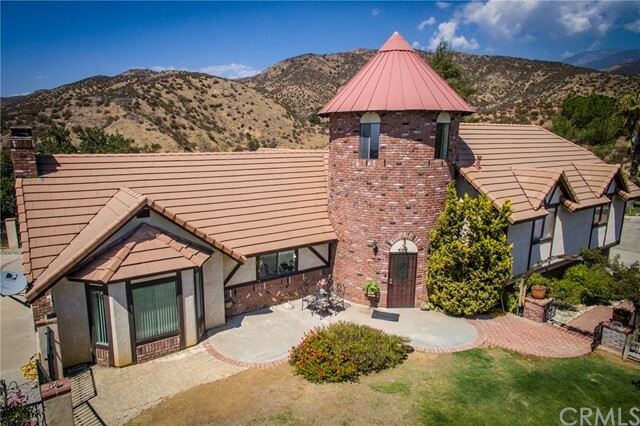 A truly unique Yucaipa home nestled on a 1.26 acre Certified Organic Farm. This 1,824 square foot home offers four spacious bedrooms with ample closet space, two bathrooms, a lovely kitchen and a must-see, four car garage/workshop. 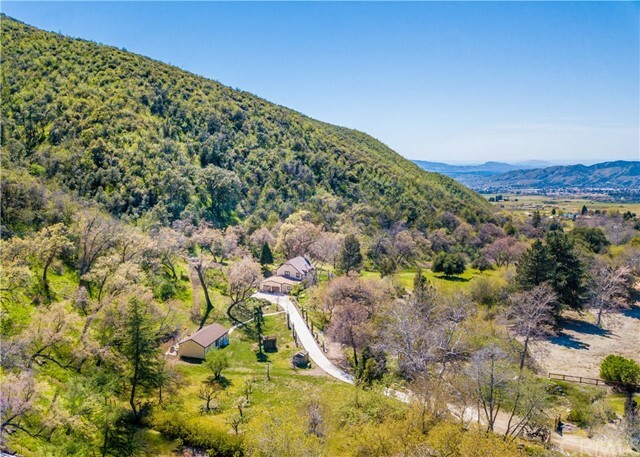 This property is truly an outdoorsman's dream; includes a Horse Barn with a stall, a tack and hay room with cement floors, two outbuildings (also with cement floors), an aviary, a large cement pad for an RV and waterlines that run from the front to the back of the property. This is a prime piece of property that is sure to fit your lifestyle and is located just minutes from the renowned Oak Glen Farms and Orchards! This home must be seen to be appreciated!" 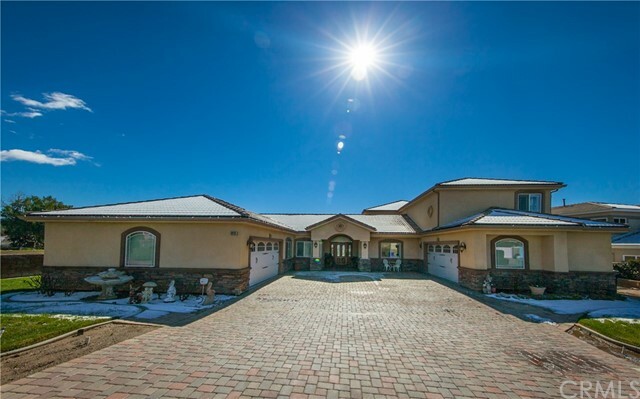 "Incredible property located in the Prestigious area of yucaipa up against the foothills on 8.62 acres surrounded by beautiful views in a private gated community- The 8.62 acres has so much to offer"
"This Modern-Ranch Style Home is Beautiful and sits on over 2 acres of flat and usable land. Located at the Foothills of Oak Glen's Apple Orchards, it's 10* cooler here and has amazing mountain views. The vaulted custom-made wood ceilings and huge windows are perfect for relaxing in your retreat style home. You will love cooking in the large open kitchen with all built-in appliances, granite counters and custom made wood cabinets. There is a formal dining area and casual breakfast room too. Three bedrooms and 2 bathrooms downstairs. A large laundry room with plenty of space to add sink and cabinetry. The upstairs loft is perfect for a study or a game-room. The master retreat upstairs boasts a separate sitting room and gym. The master bathroom has a romantic bathtub and separate over-sized shower. Step outside and enjoy the views while bbqing on your covered patio. The separate 4 car garage/workshop has a bathroom and tons of space for a man-cave or she-shed!!! There is also a plenty of parking for your RV's, boats and other toys. The current owner has put in 2 separate RV dumps for convenience. He also has a permit to store up to 3 semi trucks/trailers on the property." 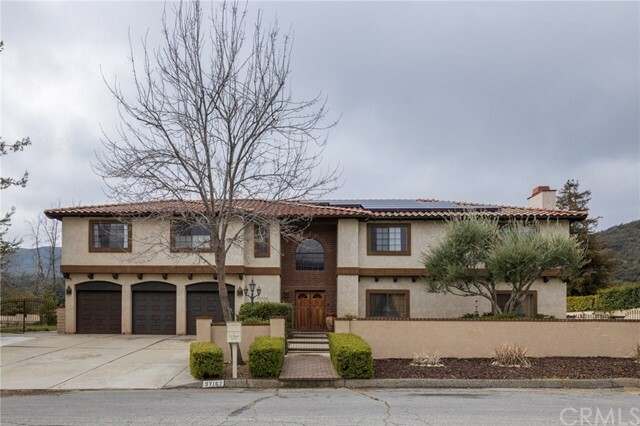 "Immaculate Turnkey Hidden Meadow Cul-de-sac Home, Nice quiet neighborhood, Gorgeous home with 2,984 Sqft, Five specious bedrooms , Four bathrooms, New two AC units, clean home inside and out, Huge backyard with well organized terraces and plenty of trees." "Welcome to 4.7 acres of prime land. City of Yucaipa has approved new zoning. The home has 3 bedrooms, 2 bathrooms. The home has a very open floor plan. You can prepare meals and see everyone in the living and dining areas. The bedrooms are very spacious. In door laundry with a large sink. Tile in entry /Living room and kitchen as well as hall, bath and laundry. One bedroom has a bamboo floor, one is carpet and the third is laminate. Drought tolerant lawn. Newly added 3 citrus trees (navel, mandarin, blood orange) 3 fruit trees (cherry, peach, plum) and flower beds.Plenty of water access everywhere all the way to the back of the property; 1.5 Piping and 1 and a quarter from street. Back flow valve installed. This is a flat, fenced Lot. Horse property, comes with a Tack and Covered Area for your horses or other animals This property is centralized in a quiet area that's near schools, colleges, shopping, restaurants, etc. easy freeway access. The city of Yucaipa is booming. There are a lot of plans for expansion." "Impeccably maintained North Bench single story home on nearly half an acre is on the market for the first time. After 13 years, the original owners are relocating. On a corner lot, entry is into a gated courtyard with outdoor fireplace. 3 interior doors lead to the courtyard. The open flowing floorplan separates a guest suite (great for company or extended family) from the other four bedrooms with the family room, kitchen, formal living and dining room between (floorplan is in supplements). The home provides for lots of storage between the laundry room, walk-in pantry, butler's pantry and linen closet. The garage is spacious with two, two car garages that are connected (with epoxy flooring). A generous side yard could be used for RV parking. You will not find a better maintained, cleaner home! Blink and it will be gone!!" "CASTLE IN THE CLOUDS!!! This house is so unique in every way. HORSE PROPERTY!!! Situated above all others, the mountain views are absolutely STUNNING! 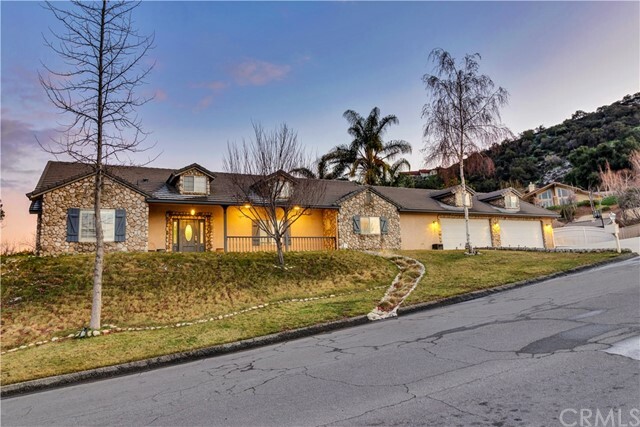 You enter the home and arrive in a beautiful foyer which looks onto the large living room with gorgeous crown molding and a large picture window looking out onto the surrounding mountains. There is a large kitchen, a formal dining room with amazing views and a family room with a gorgeous brick fireplace. There is also a casual dining area located right off the kitchen. The sweeping staircase will take you to the upper level where you will find three large bedrooms and two baths. The Master Bedroom is huge with french doors leading out to the deck where you can take in the views of the surrounding mountains. The Master Bathroom has been remodeled with new tile in the shower, counter top and floors. One of the very unique features of this home is the spiral staircase that leads up to the drum tower...The drum tower has many windows where you can enjoy the amazing views or just enjoy the solitude at the top....The backyard is perfect for entertaining. 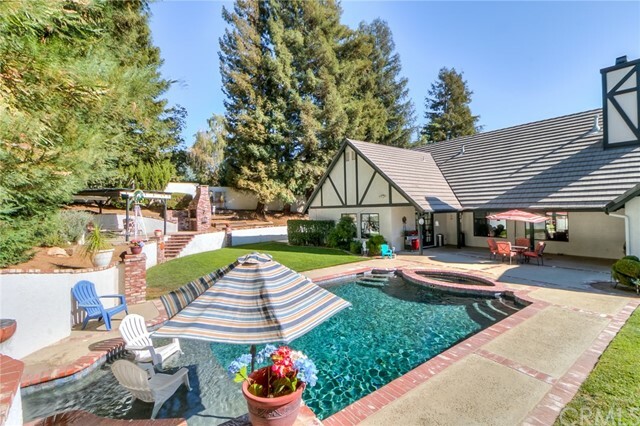 It has a gated inground pool, wading pool and jacuzzi... The back yard has a nice covered patio for additional outside enjoyment. The floor level features an over sized two car garage and a large laundry room. Also, off the garage is an addition room with a sink, mini kitchenette and full bath that would be perfect as a quest room or for extended family.. The views are endless!!!!" "Large single story home with two master bedrooms. An entertainers dream with a large kitchen that opens to the family room. The floored walk in attic is the full length of the house, plenty of space, light and ventilation for all of your seasonal decorations or future additions. There is beautiful original oak throughout the house, used brick double sided fireplace, family room with beamed ceilings. In addition to all of this there is a loft upstairs with beautiful views, currently being used as a game and music room. The yard has RV storage measuring 14 ft wide by 48 ft long. Also a she shed/shop/art room on a cement slab with electricity inside and out, a built in pool and spa with pebble tec surfacing, Baja bench (shallow end with umbrella) and multi colored lighting. Along with a beautiful fountain from Italy. Still more.... a raised gazebo area for sitting and watching the sunset along with a very large built in rotisserie BBQ, a sink and electrical outlet Copper plumbing throughout, double pane windows, two thermostats for heating and cooling one on each side of the house, two water heaters. Extra wide hallways (41 inches) and doorways (up to 35 in)"
"Custom built pool home with plenty of RV parking and perched on a beautiful view lot in Hidden Meadows. This spacious 4 bedroom 4 bath pool home has a wonderful open floor plan all on one level. Large open kitchen with granite counters, stainless steel appliances, double oven, one convection and loads of counter space and an island. Kitchen dining and open to the family room. The amazing fireplace is available for both the kitchen, dining and family room enjoyment. The home is wired for surround sound, has plantation shutters throughout, crown molding, new paint, whole house vacuum, instant hot water heater (2016), beautiful wood flooring and more. The master bedroom is huge with his and her bathrooms, custom tile and a spa tub, his and her closets with built-ins and access to the pool area. The master is also very private from the other bedrooms. There is one en suite bedroom and 2 bedrooms with jack and jill. Plenty of closet space with organizers. The large covered patios offer several entertaining areas, one has a bar set up, and there is a great built-in bbq. The pool is pepple tec and has a tranquil waterfall and a fun beach entry step. Rain gutters, 2 AC units with dual zones. All of this with wonderful panoramic mountain views. Don't forget all the RV parking, and a fun play house that could be your she shed Garage offers 700 sq.ft. of attic storage." 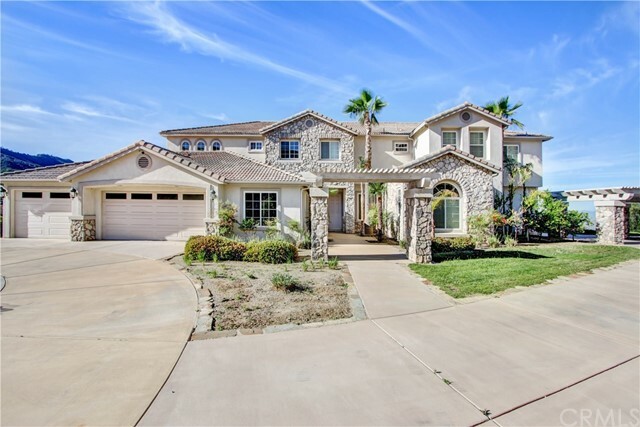 "Sensational Large Single Story Home on a Spacious Corner lot in an exclusive neighborhood of Whisper Ranch. Stunning Sunsets from this Premium View lot can be enjoyed daily. This home has been built and owned by one family who has taken impeccable care of this gem, pride of ownership is apparent. This floor plan is one the largest single story available in both Whisper Ranch and Whisper Ridge, and only a few were built. The Dramatic windowing, and expansive design makes this home unique; both a terrific family home as well as a great home for entertaining. The kitchen can host several cooks at one time; with a large pantry, and lots on counter space (granite) for family gatherings. This home has so much to offer. Tons of updates and upgrades, with two wood burning fireplaces, you simply must see to appreciate. The Gourmet Kitchen has been updated with New Cabinets, Granite and new Appliances. The flooring is brand new, the Pool and Spa have also been resurfaced and upgraded, the home was recently painted, new plumbing hardware, new water heater, and much more! WOW!! NO ELECTRIC BILLS!!! SOLAR IS PAID! NO HOA!" "This is a beautiful home on top of the Hidden Meadows. It features a turnkey four bedrooms and two bathrooms. The master retreat includes view to enjoy breathtaking views of the hills and large backyard with new sod. There are his and her walk-in closets in the master bathroom and large shower for two persons. Both bathrooms have granite counter-tops and new faucets. The kitchen has granite countertop with double islands open to the dining and family room. This is an incredible single story home with new interior and exterior paint and wood flooring. The three car garage floor are epoxy coating. Central vacuum system and radio are installed. This Lot is on a half acres and has a gated RV parking area. Forget the sky high electric bill because this home comes with solar system which has been paid. Central whole house Vacuum system and radio system. This is a perfect family home with a huge grass area for family activities and plenty of room for your dream pool. Only a 5 minute walk to the nearest park and right next door- a state park where you can take the hiking trails through the mountains in your own backyard. A quick drive will lead you to nearby historical Oak Glen where you can pick your own fruits and enjoy family friendly activities during summer and Apple Season." "LOCATION-LOCATION-LOCATION !!! 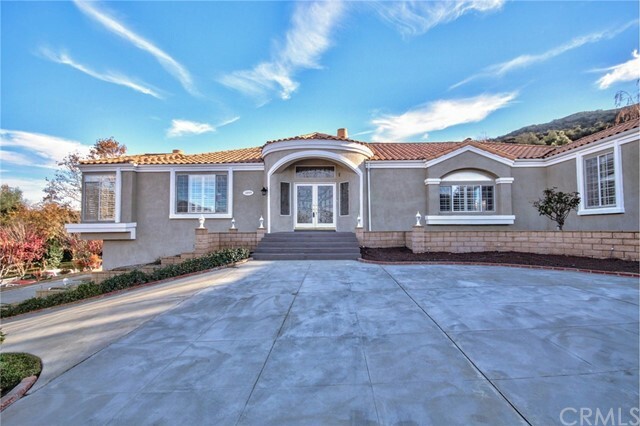 THIS IS A VERY NICE CUSTOM BUILT 2 STORY HOME NESTLED IN THE WILDWOOD CANYON AREA IN A CUL-DE-SAC. WE OFFER OVER 3000 SQFT OF LIVING AREA THAT INCLUDES A BEAUTIFUL OPEN FOYER AREA THAT SHOWS OFF THE OAK WRAP AROUND STAIR CASE. 4 BEDROOMS,3.5 BATHS,FORMAL LIVING & DINING W/ FIREPLACE, SEP FAMILY ROOM W/ FIREPLACE,GOURMET KITCHEN W/ SS APPLIANCES, CENTER ISLAND, GRANITE COUNTERS, 2 SEP SINKS, 2 SEP OVENS FOR THE CHEFS IN THE FAMILY , TRASH COMPACTOR,DISH WASHER, GAS FREE STANDING STOVE, SIDE BY SIDE FRIDG W/ BOTTOM FREEZER , GARBAGE DISPOSAL, LOTS OF CABINETS, PANTRY, IN CEILING UTILITY RACK,RAISED COUNTER BAR AREA THAT SEATS 4 AND THE BREAKFAST NOOK AREA OVER LOOKING THE BACKYARD.LAUNDRY ROOM W/ A DEEP SINK AND LOTS OF STORAGE. THE MAIN LEVEL OFFERS 1 BEDROOM W/ FULL BATH AND ADDITIONAL .5 BATH.THE 2ND LEVEL WE OFFER A HUGE MASTER SUITE W/ FIREPLACE, WALK-IN CLOSET, DECK THAT OVER LOOKS THE BACKYARD AND A LARGE MASTER BATH W/ 2 PERSON JACUZZI TUB AND SEP SHOWER. 2 MORE BEDROOMS W/ WALK-IN CLOSETS AND FULL JACK AND JILL BATH.DUEL ZONE HEATING & AIR,FRESH INSIDE PAINT, UPDATED LIGHTING IN KITCHEN AND ALL BATHS.NEWER EXTERIOR PAINT, TANK-LESS WATER HEATER, RV DRIVE AND GATE.OVERSIZE 3 CAR GARAGE W/ WORKSHOP AND LOTS OF STORAGE. 3 PATIOS 2 STORAGE SHEDS NICE LANDSCAPE W/ AUTO SPRINKLERS,FRUIT TREES,VIEWS AND LOTS MORE."